Ive recently been going through Violets clothing she's out grown and I'm absolutely gutted at some of the gorgeous pieces that don't fit her anymore! Ive been generally browsing on Pinterest for new sewing projects as I've finally bitten the bullet and pulled out my machine. 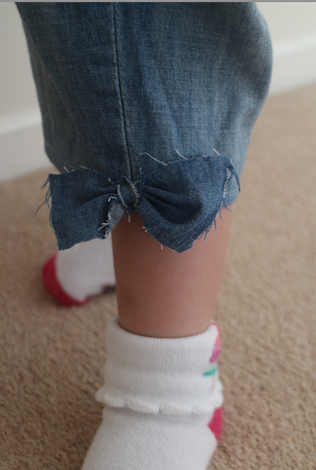 Ive come across lots of different projects on how to 'up-cycle' kids clothing and I've been doing just that! I started with this very basic vest that she literally only worn a handful of times, its like new! and of course now potty trained its just impossible to use! So i basically cut the poppers of and gave it a quick sew and there you have it a top! I can't believe i have never thought of 'up-cycling' before! 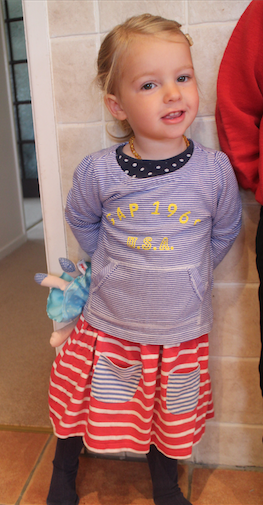 Even if she just wheres these clothes at home/ nursery or just playing in the garden I'm getting my moneys worth out of them which is all i really want! Heres a couple of other items I've 'up cycled' to! 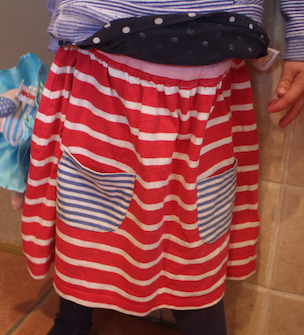 This skirt was a dress aged 12-18 months from Boden. I just cut the tshirt part of the dress of and then sewn in some elastic around the waist! These dungarees were long and had elasticated cuffs obviously too small in the leg at only aged 9-12 months! but she still fits perfectly in them otherwise so i cut the ends off and sewn on some cut bows made from the excess material! Amazing! ten out of ten. I think am gonna get my sewing machine out of my wardrobe as well and Dust it off ! YOU inspired me like always Claire!! well done.